Orthodontic treatments are a fantastic investment in both your confidence and your smile. However, it is crucial before you make the decision to know the risks of wearing braces. First of all, braces or no braces, if you don’t keep your teeth clean and don’t control your sugary food or drink intakes, you may permanently damage both your teeth and gums. The damage on your teeth is initially no more than a white or a brown mark on the tooth surface, but, if not treated, this can become a hole in time. The gums may swell, leading to bleeding while tooth brushing. This is a sign that your brushing needs to be better. Poor brushing and/or too frequent sugar intakes during an orthodontic treatment may leave permanent white marks on your teeth. Once your brace is fitted you may experience some discomfort in your mouth, as the teeth begin to move. The brace can also annoy the inside of your mouth. Even speech can be temporarily affected. This, however, is totally normal and will pass in few days. If you fail to comply with the treatment regimen – i.e. repeatedly break the brace brackets, miss an appointment, fail to keep the brace clean – the treatment will probably last much longer than initially planned. If you refuse to follow the orthodontist’s instructions time and time again, your treatment may be stopped; in cases such as these, your teeth may even end up in a worse condition than the one that instigated the treatment. When teeth are moved, there is always a small risk that the movement may kill off some nerve or blood supply to the tooth. The risk is slightly increased if you have previously damaged or banged your teeth. The affected teeth may require further dental treatment. As is usually the case, you’ll need to look out for dark spots on your teeth or toothaches. Moving the teeth means shortening the roots of the teeth as well; in rare cases the roots can shorten substantially. If a tooth has been previously traumatised, the risk of this increases. 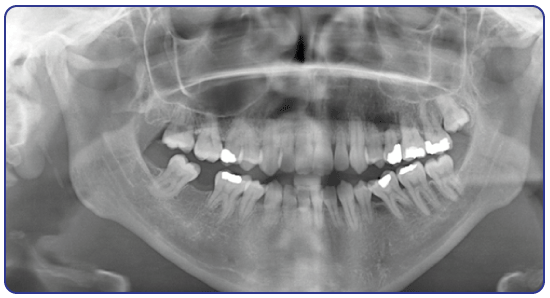 The radiograph below shows severe tooth root shortening. This is both rare and unusual in paatients. When the treatment is over, you will be given retainers to wear and instructed on how to wear them. Tooth movement after treatment is very unpredictable. Some people’s teeth can move substantially whereas some only undergo minor changes. Tooth movement is normal throughout life and is just part of the ageing process. The only way to guarantee that teeth do not move is to wear a retainer on a part-time basis indefinitely.